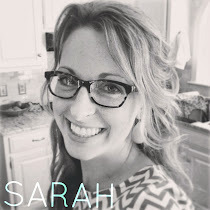 My creative Mom helped host a couples dessert shower this weekend for our dear friend Sara and her future hubby, Robin. The shower had a spring green and white theme and was busting with cute ideas I want to share with you. Mom made raspberry lemonade ice cubes in the shape of hearts! Regular ice cubes would melt and water down the lemonade, but not these little cuties! The menu included: chocolate and vanilla cupcakes, lemon coconut angel food cake, miniature key lime pies, Oreo balls, peanut butter balls and ice cream. Serving ice cream is always a sticky job, but this was a genius way to get around the mess. Individual balls of ice cream were scooped and placed in a muffin tin lined with foil muffin cups. The balls were then refrozen and brought out when it was time to eat. Here's the trifle dish I etched for Sara. I'll be posting a tutorial this week showing you how easy this is to make, so check back soon! I can not wait for your etching tutorial! I would love to make those as gifts for a couple of friends. Beautiful! Love those raspberry lemonade heart shaped ice cubs- how sweet and genius! so many good ideas. love the ice cubes. the cupcakes look beautiful. looking forward to an etching tutorial. easy??? really? can't wait to hear about it. Hey There! I love the ice cream scopes-that is such a neat idea. I can't wait to learn how the etching works. Been reading though past posts and love the pre-scooping of ice-cream - genius! Wow...that is a gorgeous feast! I love the etched trifle bowl...such a neat idea!